Here are some of my favorite things! First photo above is my favorite, ServeItUp from Fusionbrands. SO SMART! 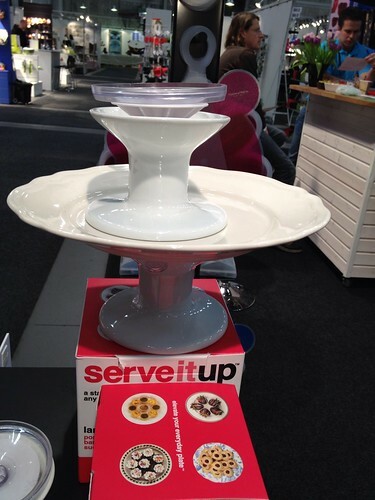 It's a loose cake stand - that can be attached to any plate. 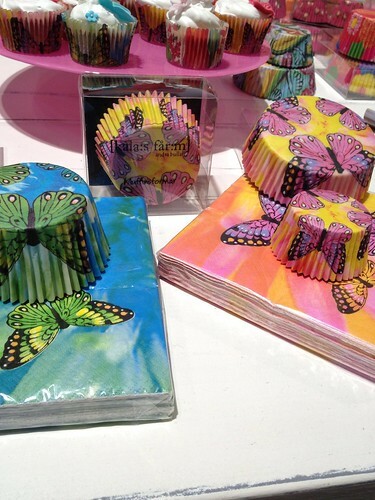 Bad explanation, let's try again: you can turn any plate into a cake stand. I need this. It comes in two sizes. I need both. 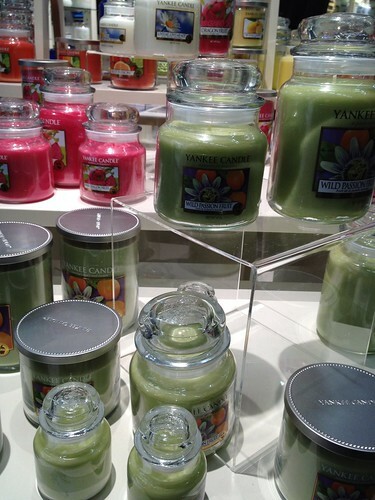 Yankee Candle: always a favorite. 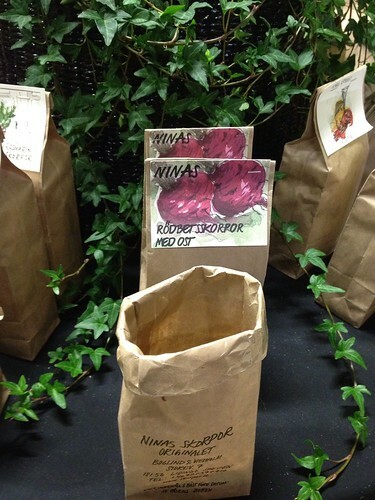 They had some gorgeous new scents, and my favorite was Wild Passion Fruit. Yummy! 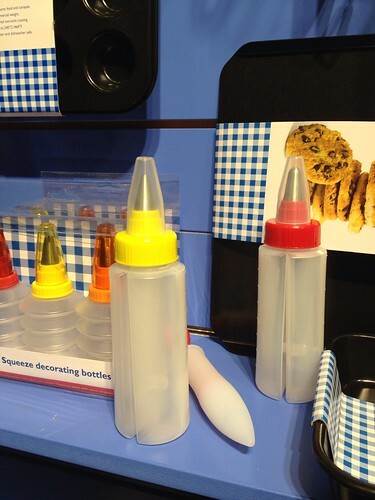 Not sure of the brand, but two-part squeeze bottles to use two-color frosting? Smart! 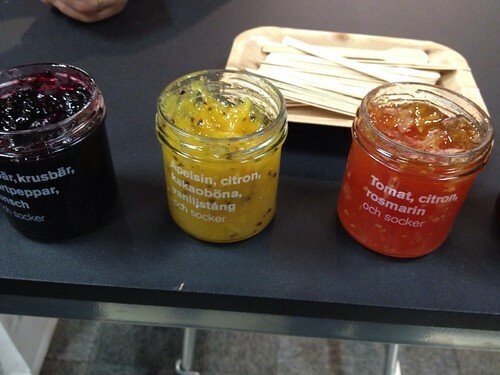 An absolutely fabulous jam with oranges, lemons, vanilla and crushed cocoa beans. 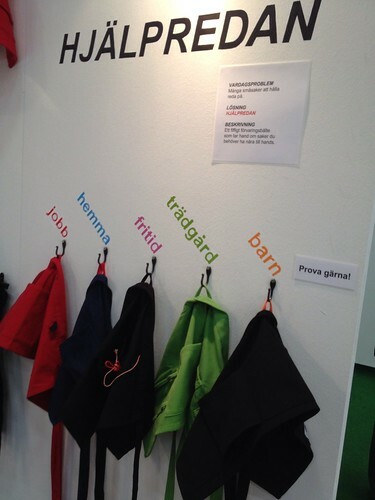 This was made by Äkta Sylt. 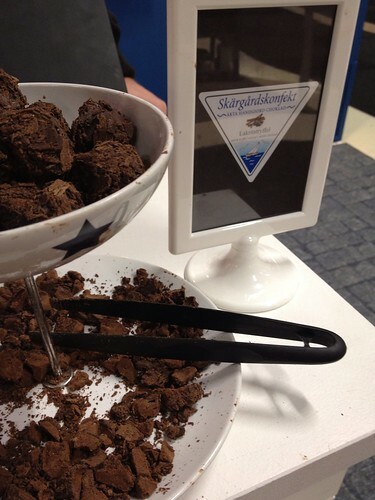 Licorice chocolate truffles by Skärgårdskonfekt. I'm not a huge licorice fan, but it's a very trendy flavor here, and you saw it everywhere at the fair. These were tasty though! 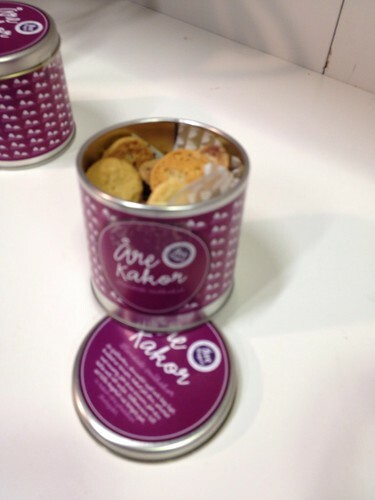 A tiny jar of SUPERTINY cookies, from Åre Bageri. Very cute. And very tasty, too. Yummy cantuccini with cheese and beetroots - sounds odd but tasted great. I could imagine these instead of croutons, in a salad... or just to nibble on. Ninas Skorpor. 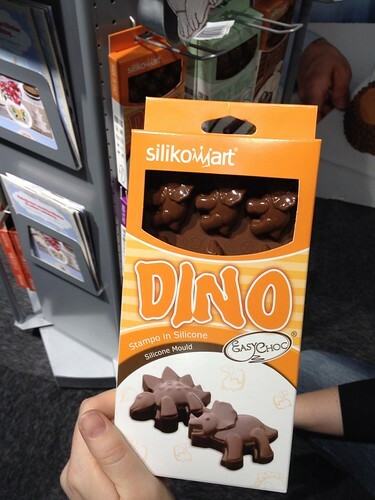 Adorable dinosaur chocolate molds - must get these. From Silikomart. Cool Globe, a Swedish innovation. 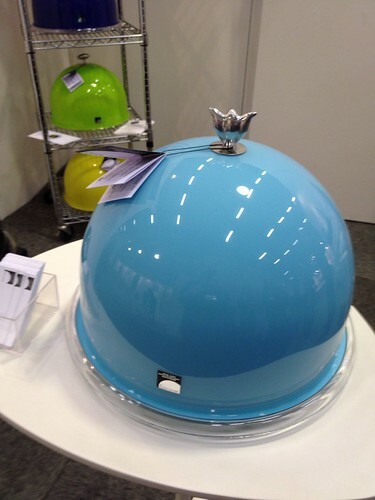 The domed lid holds an ice pack, to keep the food inside nice and cool. I want one of these for breakfast out on our deck in the summer! 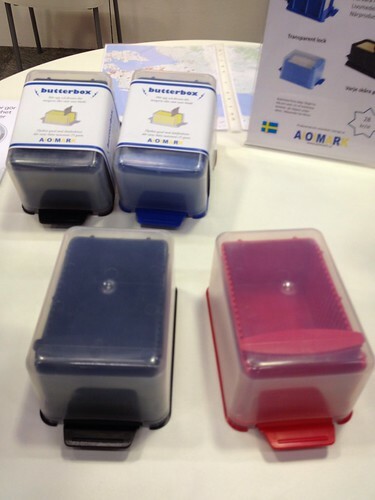 Butterbox - the perfect way to store butter (which in Sweden comes in bricks, not sticks) and with a built in slicer. 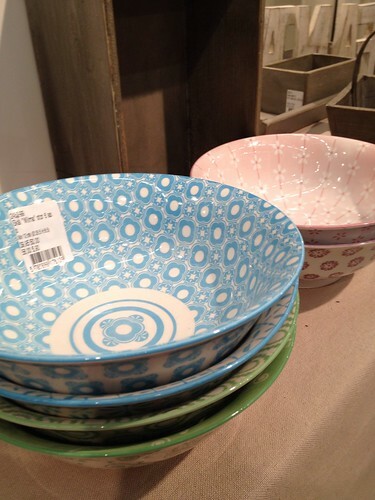 Lovely bowls, patterned both inside and out, from Ib Laursen. A super nifty little apron with pockets, not really for cooking, but perfect for gardening. Or for teachers. I am strongly considering this for a gift to Titus pre-school teachers. From Fröken Smart. I've shown Frozzypack before - a lunch box where the lid is actually an ice pack. Very smart! 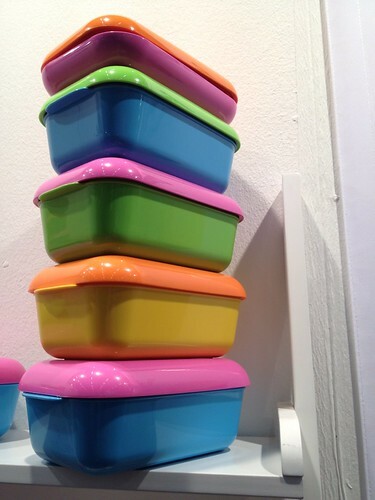 They now come in pretty spring colors, and soon they'll have a slightly bigger size for sale, too. smörlådan var ju smart som tusan!